If you don’t have forward momentum, it can feel like you are sinking in quicksand. Ever felt something like this? Let’s face it. We all can find ourselves stuck in a rut sometimes. It can feel like we are stuck in quicksand, and the more we think about it, the more we try to do, we just find ourselves in deeper and deeper. 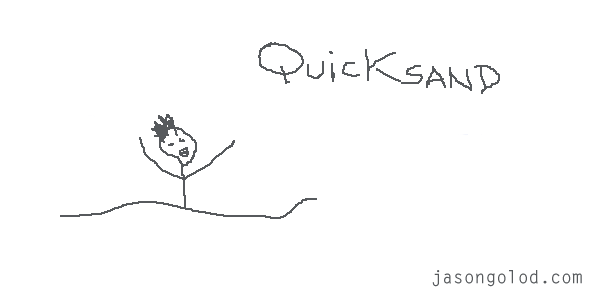 There are ways to deal with quicksand. One of the best ways to keep your momentum is to avoid habits and places where you find your quicksand. Be self-aware. Ask yourself how your activity is helping you reach your stated goals (you have written S.M.A.R.T. goals, right?). If it doesn’t, stop immediately. Be sure you have written S.M.A.R.T. goals and that you review them every morning. Each week, replace one bad habit with a good habit. James Clear, a true thought leader, has a great idea to read more books…take baby steps. If you want to read more books, then start by reading 20 pages a day. He reasons that most people can knock out 20 pages in 30 minutes or less. At that pace you can read about 36 books a year, or 3 books a month. Not bad right? You can apply this “baby steps technique” to anything. Looking to complete a project with 100 moving parts? Set aside 15 or 30 minutes to work on it and go. Don’t do something else. Don’t make coffee. Just start. If you haven’t make a S.M.A.R.T. goal, start there. Once you are done, dissect your goals and build a strategy for success. Then tackle each item in their order of importance. Just do it. Don’t fall into the trap of negotiating yourself from doing something. Pick up a book and read 20 pages. Build momentum. If 20 is too much, read 10. Just do it. Find something you want to complete and start working on it for 15 minutes. Remember, done is better than perfect. Just start doing something that will help you reach your goals.